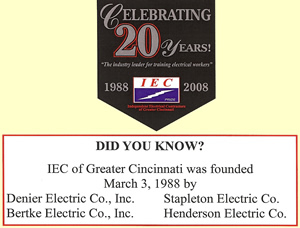 In 1966, Joseph J. Stapleton made a commitment to provide excellent customer service in the construction electrical industry. Through the years, that idea has grown into a thriving company. The values that Joe Stapleton started this business with have been passed on to each of the employees of Stapleton Electric Co. Our field employees are constantly striving to maintain our company’s high standards, and our office staff is dedicated to ensuring the accuracy and timely completion of all necessary "behind the scenes" work. Together, these two teams become one strong force, capable of completing any job on time, and within budget. These values allow us to ensure that our customers can rely on us to provide outstanding service at reasonable rates, all of which is made possible through extraordinary teamwork and trusted leadership. "Our mission is to be a full service integrated contractor." Designed By Stapleton Electric Co.
© Stapleton Electric Co. All rights reserved.